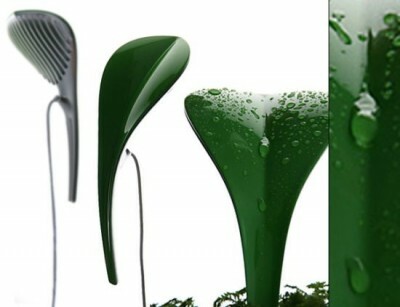 Industrial designer Jacky Wu has designed a simple artificial leaf to aid us in our plant watering. This concept design has been named Dew Drop and aims to keep your plants watered without you ever needing to move a watering can. The Dew Drop works from the basic principles of condensation, thereby extracting the water vapour out of the air and letting it run into your plant pot. By simply placing the artificial leaf into the plant pot and plugging it in you should be ensuring your plant stays watered, with the water in the air condensing on the leaf and being funneled down into the plant pot. Unless you happen to run your house solely from solar power (or any other green electricity source) the green benefits of such a device seem limited. 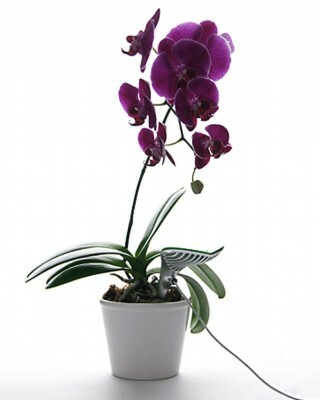 Though you would obviously save yourself a small amount of water use, the power needs of such a device could render it pointless and may even make it a more harmful way for you to water your plants. It may also have a limited effect in a building that has air conditioning (AC) or a dehumidifier, as the water vapour in the air will have already been removed to some extent from the area. The Dew Drop should water your plant well in the right environment and would certainly be useful to those who easily forget to water their plants. How natural it would look though to have multiple plants trailing electrical leads is another matter.